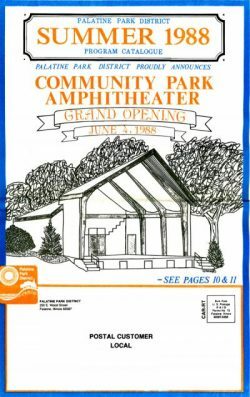 In 1988, Palatine Park District held the grand opening of the then newly constructed Community Park Amphitheater, which would become the home for free summer outdoor entertainment for the community. 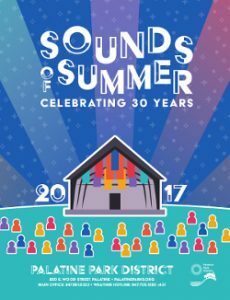 While the arts have been prevalent in Palatine for well over three decades, 2017 is a milestone worthy of pause and recognition as it marks the 30th annual Sounds of Summer Concert Series. The inaugural concert series took place in the summer of 1988 and featured such performances as Big Twist and The Mellow Fellows, The Great Pretenders, The Charade Players, and Palatine Concert Band. The venue was later renamed in 2002 to Fred P. Hall Amphitheater in recognition of former Executive Director Hall’s 31 years of dedicated service. “Palatine Park District has been involved in the arts a lot longer than 30 years,” said Fred Hall. “We got very involved with community theatre with the purchase of Cutting Hall in ‘77, and prior to that the District made significant efforts to support the Palatine Village Band–now Palatine Concert Band.” Palatine Concert Band presents 2-3 performances each Sounds of Summer season and has done so since its inaugural event. Palatine Park District continues to support Palatine Concert Band financially today, and also provides year-round storage, rehearsal, and performance space. Following the purchase of Towne Square in 1997, Friday Lunch Special concerts were moved from the Amphitheater to Towne Square in the summer of 2000. As a further addition to the summer concert series, former Cultural Arts Coordinator Carol Lange developed the 4th Thursday Concerts at Towne Square in 2009 featuring performances by local artists. Today, the Sounds of Summer Concert Series is made up of Main Stage Concerts at Fred P. Hall Amphitheater, and Towne Square Spotlight and Friday Family Picnic performances at Towne Square. On Wednesday, June 7, Sounds of Summer will kick-off its 30th annual concert series with a line-up of eighteen performances. Allegro Community Chorus will make their Main Stage Concert debut this summer, along with the return of several resident favorites including Barefoot Hawaiians, American English, and 7th Heaven. Check out the complete concert series lineup on our website under “Events” and, new this year, view the 2017 Sounds of Summer Concert Series program book online.